In China, the money isn’t in Web advertising. It is in micro-transactions. At least that is the case for Tencent, which operates the largest instant-messaging network in China and is one of the largest overall portals. Tencent—which includes the QQ IM service, QQ Show (an avatar social network modeled after Korea’s Cyworld), and QQ Pet (virtual pet portal)—is the No. 21 Web property in the world and the second largest in China after Baidu (the two keep switching the No. 1 and No . 2 spots). 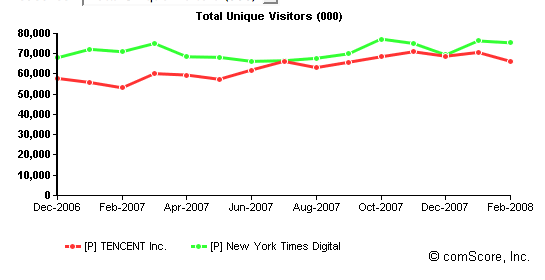 According to comScore, it attracted 66.2 million unique visitors in February, half a million less than Baidu and about 10 million less than all the sites run by New York Times Digital (which includes NYTimes.com, About.com, Boston.com,and a bunch of other newspaper sites). Tencent is publicly traded. In 2007, it made $523 million in revenues, and $224 million in operating profits. That gives it a 43 percent operating margin. In contrast, Yahoo’s operating margin is 10.4 percent. Digital goods are a big revenue driver for Chinese Web companies and are extremely profitable. In the U.S., with a few exceptions (the virtual economies in virtual worlds and online video games), Web surfers don’t really like to pay for digital goods. Is this a cultural thing, or can it change? It is important to remember that there are other ways to make money on the Web besides advertising.